With the Devil's Finger Coral, a creative aquarist can create a colorful and artistic display! The Devil's Finger Coral Lobophytum sp. is a very easy coral to care for and to propagate. The great variety of color and shape that this genus has to offer can present an intriguing challenge to even the advanced aquarist. The Lobophytum sp. form low encrusting colonies with species being bowl-shaped or standing more erect. Colonies in the wild grow to over 3 feet (1 meter) in diameter. They are a soft coral that have a thick and heavy "skin" with lobed projections. The flesh feels grainy, and can be brittle, so handle with care. The stalks of the Devil's Finger Coral are fat and short, with compact "heads" or clusters at the top of the coral. These clusters are crowded together, tending to fold or create finger-like extensions or lobes. Thus the common names include Finger Leather Corals, Lobed Leather Coral, Thick Finger Coral, Devil's Hand Coral, and Cabbage Leather Coral. Depending on the species, their lobes vary in size and number and are sprinkled with retractable polyps. 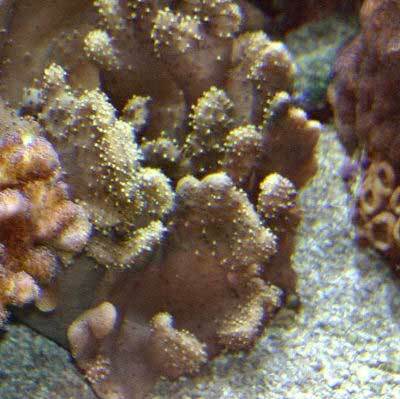 The polyps look more like tufts instead of the fully developed polyps seen on other corals. When feeding the polyps are out, and as nutrients are captured, the polyps retract. These corals are generally shades of brown in the wild, with sometimes lighter contrasting colored polyps sparsely scattered across the surface. Finding the colorful specimens can take some patience, but locating aquacultured colors of green, pink, gray, mustards, browns, creams and everything in-between makes this an enjoyable venture. The Lobophytum genus are some of the best beginner soft corals you can buy. They produce less mucous, and are more forgiving than other leather corals. They are also not as sensitive to handling, especially when propagation is done. These were some of the first corals introduced into the trade because they travel well. Even in a species specific tank, each animal's unique distinctions make the display fascinating, and so are rewarding for advanced aquarists as well. The Devil's Finger Coral is a hardy, adaptable coral and can be easy to care for. They come from a wide variety of environments at depths of 20 to 60 (6 to 18 m). They are found near the shore on shallow waters reef flats, where they are most prolific, as well as turbid lagoons attached to rubble. Some are exposed to low tide as well. Moderate water movement and a medium to strong light is recommended. For nutrition they use the symbiotic algae, zooxanthellae, that lives within their tissue, and extracting nutrients from the water. In a mature system they really do not need to be fed at, but do need more intense lighting for good zooxanthellae growth. This is a cool video of a Hippo Tank enjoying a "rest" on this Devil's Hand Coral. These corals give off very strong toxins that can retard the growth or kill stony corals. If the tank is hundreds of gallons, they may be okay together. When they sloth off their mucus, make sure it doesn't land on any other corals or it will kill them. Tank size for just this coral is 50 gallons, and being subtropical, the L. pauciforum will require a chiller to keep the temperature lower than 73˚F. Leather Coral Information: The Lobophytum genus was described by Marenzeller in 1886. They belong to the family Alcyoniidae, which are referred to as octocorals. There are over 43 species and some of the common names are Lobophytum sp., Finger Leather Corals, Lobed Leather Coral, Thick Finger Coral, Devil's Hand Coral, and Cabbage Leather Coral. Intense greens, yellows and pinks have been specifically used for coral farming, and make great additions to a display. Where Lobophytum Corals Are Found: The Lobophytum genus are found in the Indo-Pacific and Red Sea. Lobophytum Coral Habitat: The Lobophytum genus inhabits depths of 20 to 60 feet (6 to 18 m). They are found near the shore in shallow waters on reef flats, where they are most prolific, and can also be found in turbid lagoons attached to rubble, and other diverse locations. Some are even exposed to low tide at which time they become flaccid, loosing much of the water contained in the coral, and conform to the contours of the substrate. When the tide comes back in they re-absorb water and become erect again. Solar radiation, high temperatures, and high salinity can be tolerated for a short time. The Lobophytum genus is not on the IUCN Red List for Endangered Species. What do Lobophytum Corals look like: The Lobophytum are a soft coral that have a thick and heavy "skin" with lobed projections, that form low encrusting colonies. Some species are bowl-shaped or stand more erect, and colonies in the wild grow to over 3 feet (1 meter) in diameter. Their compact "heads" or clusters at the top of the coral, are crowded together, forming fingerlike folds across the top and they have stalks that are fat and short. Depending on the species, their lobes vary in size and number, and can have autozooid polyps for feeding and siphonozooid polyps (that are hard to see) for water movement. Their retractable polyps are more like tufts of 8 tentacles, instead of a fully developed polyps that are seen on other corals. When feeding the polyps are out, and as nutrients are captured, the polyps retract. The flesh feels grainy, and can be brittle, so handle with care. Colors range from dull gray, pink, cream, brownish, green, yellow and many colors in-between those shades. It is unknown how long these corals live. Leather Coral Care: The Devil's Finger Coral Lobophytum sp. is easy to keep and propagate, making them a great coral for the beginner. Most of the Leather corals go through a period of slothing off their mucous layer, during which it fails to expand. It will also shed if conditions are not right or something is bothering it. Sometimes it is hard to tell the difference. This leather can hurt other corals if it is touching them, so be sure to leave enough room between species. Leather Coral Feeding: In the wild, Lobophytum corals have developed several feeding strategies. They capture microscopic food particles from the water column, can absorb dissolved organic matter, and have a symbiotic relationship with a marine algae known as zooxanthellae, where they also receive some of their nutrients. In captivity the Devil's Finger Coral may be fed phyto- and micro- zooplankton, but do well with extracting nutrients from the water and really do not need to be fed at all in mature systems. For maximum growth, more intense lighting is needed since this type of coral thrives more on light, which supports its zooxanthellae, than larger foods. Stable tank conditions are needed to keep the Lobophytum genus. Doing water changes of 20% a month or 10% biweekly is needed, although it is suggested that doing 5% water changes once a week will replenish many of the needed additives. Soft corals still need to have proper chemical levels for proper growth. Iodine is used up quickly in captive environments, and does need to be added to the top off water or to the tank regularly. Make sure you have a test to make sure your levels are sufficient. Frequent water changes are preferred over adding other supplements. A typical live rock/reef environment is what is needed for your Devil's Finger Coral, along with some fish for organic matter production and plenty of room to grow.. Provide proper lighting and water movement. They need a moderate to strong water flow. They also like moderate to high lighting, allow more time to adjust to metal halides. If you have weaker lighting place them closer to the top, but closer to the bottom if you have stronger lights. The Lobophytum genus is semi-aggressive toward other sensitive corals, like the stony corals. Marine Lighting: Moderate to high, allow more time to adjust to metal halides. Water Region: Top placement if you have weaker lights and bottom if you have stronger lights. The Devil's Finger Coral is semi-aggressive. Although the Lobophytum sp. is not as toxic as some leathers, they can still be dangerous to sensitive corals like stony corals. It has been stated by experts that the presence of this coral in an aquarium can inhibit growth of certain stony corals, although with an excellent filtration system and large water volume, this problem may not stunt their growth as much. When slothing off their mucous layer, be sure that the current will not allow this mucous to land on other corals. At first this gel like mucous was thought to be sloughed off to get rid of disease or to regenerate. This is has actually not been substantiated and scientists are still trying to figure out the reason for this behavior. The side benefit is to keep algae from accumulating, but that is not determined as the reason they shed. In the wild they are frequently gnawed on by snails and free-living bristleworms. Though there is much research to be done, it has been found that the Cabbage Leather Coral Lobophytum crassum does have a distinct sexual difference, and it is suggested that other Lobophytum species may have a similar orientation. Males of the L. crassum, are distinguishable once they are 7" across (18 cm), 2 years old and weigh at least 3 ounces (83 g). At this point gonads are visible. This is actually quite typical of many stony corals. The Lobophytum genus will bud or pinch out daughter colonies, and will grow quickly with higher lighting intensities that can be achieved with Metal Halide or natural sunlight. Devil's Finger Coral is very easy to propagate, for just a small piece or for a large frag, but with a few variations in procedure. Using either procedure, the coral will more than likely deflate, but with good water flow it will recover. Corals can emit a nasty and at times noxious odor, so be sure there is good ventilation. Clean up any mucous when finished to prevent any possible health problems. Soft Corals for Sale: The Devil's Finger Coral Lobophytum sp. is very easy to find pet shops and on line. Online they can run about $25.00 to $45.00 USD and up, depending on size and/or color. yes, thank you for letting us know. I have2 Devils Finger Leather Corals, they are attached to 1 Live Rock. They have both grown substantially in the last Year. I leave plenty of room next to them. They are easy and are good looking. I had them in the back of the tank, but recently moved them to the center of the tank. They are still doing very well. I have read that they only grow three inches, but mine are at least 5 inches. They are a good Coral to have.